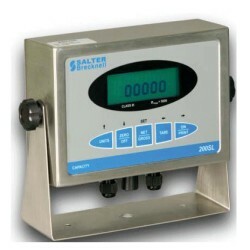 The Salter Brecknell 200SL is a digital indicator housed in a NEMA 4X Stainless Steel enclosure. It comes with a large (.8") LCD screen for easy readout and supplies enough current for up to 4-350 ohm load cells. The unit also comes complete with peak hold, which allows you to lock the weight on the digital readout. The Salter Brecknell 200SL is a general purpose digital indicator housed in a NEMA 4X Stainless Steel enclosure. It comes with a large (.8") LCD screen for easy readout of up to 50,000 display divisions, and supplies enough current for up to 4-350 ohm load cells. All setup parameters may be entered via the front panel keys. The 200SL uses full duplex RS-232 serial format for communication with many types of attached support equipment. The unit can transmit data on demand, or continuously in a popular data protocol to match a wide variety of printers, remote displays, or personal computers. The unit also comes complete with peak hold, which allows you to lock the weight on the digital readout. · Construction: Stainless steel case, stainless steel mounting bracket. · Battery Life: Approximately 20 hours depending on number and type of load cells, backlight etc. · Indicator Mounting Bracket: Stainless steel construction.